Every morning, I commute to work with about 20 of my closest friends. And they all fit neatly in my pocket. OK, so I’m really talking about podcasts. There aren’t actual tiny people in my pocket. Except for Steve, the tiny person who lives in my pocket. Obviously. Anyway, if you’re a fan of podcasts like I am, you’ll know why I dubbed them my “friends.” Each show feels built just for you. You get to know a host or a brand’s quirks and personalities in a deeper way than you can with most other forms of content. Podcasting is intimacy that scales. However, that personal, almost casual feel of many podcasts belies their true nature: A great show is incredibly hard to create. Despite the difficulty in creating an addicting show, more brands are launching their own podcasts to support their marketing, including Slack, GE, eBay, HubSpot, Buffer, and venture-capital firm Andreessen Horowitz to name a few. But marketing teams face problems in keeping their show both consistent and high quality. Just ask brands that started strong then “pod faded” like Prudential or those with endless resources and smarts who can’t seem to grasp the simplest quality issues in their sound or listener experience like McKinsey. While there’s virtually no barrier to entry to create and share a show, there’s tremendous friction in making that show great. Luckily, if we squint hard enough, we can see how top shows stay afloat and, more importantly, innovate. Let’s take a look at a few podcasts, each with one major productivity lesson we can learn for our own podcast process – as well as other forms of content marketing. At the end, I’ve shared a template for a Trello board to help organize your podcast’s editorial pipeline. Ask yourself: What’s my show’s episode format? Scott Monty is the former head of social media for Ford and a well-known keynote speaker and brand strategist. He now leads the C-suite advisory group, Brain+Trust. His weekly newsletter, The Full Monty, features a companion podcast of the same name – a weekly, 15-minute show. The hallmark of the show, aside from Scott’s golden voice, is a really tight format that helps him produce episodes with minimal time and budget while still delivering a really great product to his listeners. A BLOCK: Intro – 60 seconds: Scott intros the show concept in about 30 to 40 seconds. Then he gives you the headlines he’ll cover in the episode in the next 20 to 30 seconds. B BLOCK: Lead story – 4 to 5 minutes: Scott then gives one quick headline (e.g., “LinkedIn Spam”) that’s compelling enough to make you keep listening. He gives you the source of the story first, whether it’s coverage of a news event or a personal anecdote that led to a realization. He finishes this section with a clever limerick about the story. C BLOCK: Trivia question – 30 seconds: You then hear tuba sounds and an announcer briefly introducing the trivia section. Scott delivers the question and promises the answer at the end of the show – a great tactic to help him accomplish really the No. 1 job of any good host: Get listeners to finish the episode. The tubas then transition into the next section. D BLOCK: Page 2 – 4 to 5 minutes: The second and final large chapter of his episode is called Page 2. Scott teases a larger lesson from something that happened in the last week. For instance, when CBS Sunday Morning host Charles Osgood retired, Scott used Page 2 to talk about the cult of personality – a large topic with something both brands and individuals can learn in the era of social media, personal brands, and mini-media empires built around people. As in B Block, Scott closes with a limerick about the preceding story. He then plays a quick musical tone to move to the next section. E BLOCK: Trivia answer – 30 seconds: Scott answers the trivia question, followed by one final tuba sound signaling the end of the trivia and end of E Block. F BLOCK: Calls to action – 2 minutes: You hear the usual housekeeping list (got a story? can you rate us? want to subscribe?). Then, Scott points out a couple big news items from his newsletter that didn’t make the podcast, as well as the big questions they create. In doing so, he teases listeners to check out the newsletter. Look, I know you’re thinking, “Man, that’s a lot!” And it is. Remember, that’s just a 15-minute show. But now that Scott can predictably and consistently create a high-quality episode, he can experiment with that rundown, produce more and better shows, and ultimately help the listener fall in love with The Full Monty. Avoid the race to the bottom of simply booking the biggest guests in your niche and meandering through an unplanned episode. Instead, find your format. The beauty of podcasting is its open-endedness, and the danger of podcasting is, well, its open-endedness. So many things prevent us from creating an episode worth finishing. One issue is the amount of stuff we pack into an episode since we never get “talker’s block.” Another is that guests who readily agree to appear often love to talk – and they can often take the interview in directions you wish they hadn’t. Lastly, we simply fall in love with the wide open creative field that is podcasting and careen around without purpose. But just like an episode rundown puts constraints on the creative, a time target provides the necessary constraint to make you a better host/producer/writer for your show. I know you love listening to your own 60-minute episode. You even hear from colleagues and others in your network that they love the show. And while drop-off data is tough to come by with this medium, look in the mirror and ask yourself: Is 60 minutes really necessary to deliver the most value to others? Mike is the host of the popular show Dirty Jobs and arguably the only podcast host whose voice is higher-karat gold than Scott Monty’s. Mike’s show is a lot looser than Scott’s, containing fewer individual sections in the episode rundown. But Mike’s extremely tight time target makes the episodes incredibly good listening. While many of us struggle to keep an interview to less than 60 minutes or perhaps 30, Mike’s target is an eyebrow-raising 10 minutes! TEN! How can you possibly deliver value in the same time it normally takes branded shows to finish the intro music and resumes of its guests? Well, Mike’s a pro who, yes, comes from TV, where the show rundown and time constraints are simply realities. He knows the value of maximizing every moment, and while this certainly makes the creative amazing, it also makes him way more productive than the average marketer. Not unlike you, Mike’s a busy guy. He hosts Dirty Jobs on the Discovery Channel. He hosts another on CNN. He narrates several more. He does commercials, most notably for Ford. All of that requires travel and preparation time. On the side, he launched a foundation focused on blue-collar workers and jobs. So naturally, he wanted to launch a podcast, that friction-filled media project. When he can finally find time to sit in a studio, don’t you think it behooves him to record multiple episodes? Kinda hard to do that with 60-minute shows, no? With his 10-minute format, not only is he forced to deliver just the good stuff, he can knock out tons of episodes in just a couple hours’ time. Brilliant. Simply by trying a bunch of potential segments or series within your show, you can see what your audience loves and redeploy those segments periodically on a repeat basis. You can even give that section a name or a musical intro. Again, we’re killing two birds with the same stone, because man, how much do you just hate birds? The first bird to aim for is the listener experience, and the second is your productivity. The experience gets better when a listener feels that sense of intimacy, and a semi-recurring content brand helps your audience feel like they’re “in” on it. They know what to expect and eagerly anticipate these sections of your show. The second avian adversary to address is your own productivity. When you’re pressed for time, lack material, or need to work on something else, you now have a predictable section or entire episode style to use. Gimlet creates highly produced podcasts, including Reply All, a show that claims to be “about the internet,” but really focuses on the human condition through the lens of the web. Over time, hosts PJ Vogt and Alex Goldman have established multiple content brands within their show. One such brand is called Yes-Yes-No. The concept is simple but addicting: The co-hosts’ boss and Gimlet CEO Alex Blumberg finds a tweet involving internet culture that he doesn’t understand, and the boys help him get it. Typically, the tweets involve multiple layers of internet meme-dom (e.g., a GIF from the presidential election but shared with someone’s comment that pulls from another internet trope). They begin the section by defining what a Yes-Yes-No is. Once listeners hear the tweet, each host and the CEO reveals whether or not they understand it. Generally, the co-hosts both say yes, while Blumberg says no – hence the name. As a bonus, I wanted to share a public Trello board outlining the editorial pipeline of a story-driven podcast. Feel free to borrow, adapt, or outright steal from this – since it’s my show, I can say such things. My podcast, Unthinkable, explores the interesting trend of everyone racing to average by following a list or best practice. How do you break from that cycle to create exceptional content instead? My thesis is that you have to trust your intuition. It won’t come from someone else’s idea or advice. I ask big, ambitious questions and want to match that concept with a big, ambitious show style. All of this to say: My workflow could derail. Fast! So we rely heavily on Trello to stay organized, and I wanted to take you behind the scenes in the hopes it’ll help you better turn your creative intuition into action. You can view the board here. If you have any questions, I’d be happy to answer in the comments. 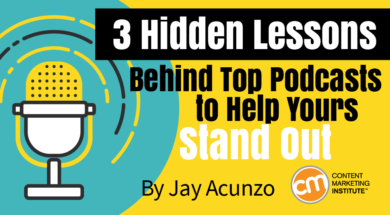 Looking for more ways to maximize the impact of your podcast content? Get practical insights, advice, and answers in our 2018 Guide to Essential Content Marketing Tactics.